There were some amazing photographs on display and there were a few artists that have incorporated the skull into their own work. I decided to submit a print I had produced at the very start of this year, the title of the work ‘reassurance’ features a photograph of myself at the beach with a skull painted onto my face. The photo was inspired by my Honours research project that explored the growing interest in the skull within Melbourne’s urban / street culture. 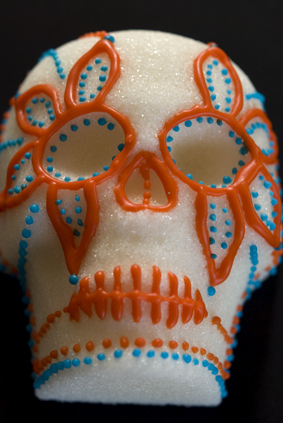 I started to develop an interest for the Mexican sugar skulls that I discovered in many bars, restaurants, shops and galleries across Melbourne. These colourful and decorative ornaments inspired me to create a series of black and white self portraits that depict my own personal perspectives of the Mexican sugar skulls that are commonly associated with the Day of the Dead Festival. Once I completed my degree, I continued taking photographs of myself in various locations in order to discover my own interpretations of death and the depiction of the skull in the contemporary visual culture. I’m still searching for a specific answer, which has been rather difficult as my own personal interpretations do change on a daily basis. I decided to enter the photograph of myself at the beach that questions what happens after death, what happens when the human body deteriorates? Does everything suddenly turn to darkness or do we move from the living world to a completely different place? It’s really hard to tell as there isn’t one definite answer, how can we define death if we have never experienced it before? If you would like any further information please click on the links below. 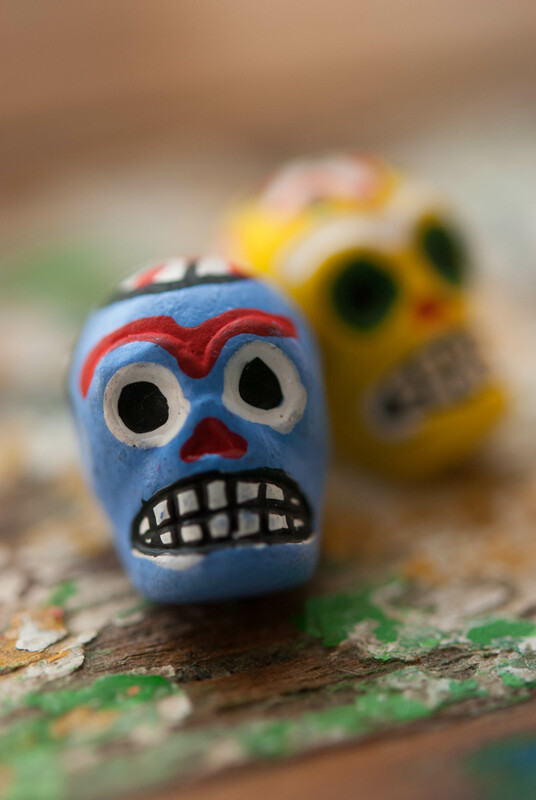 A couple of weeks ago, I received a small graduation gift from a local Day of the Dead Store in Melbourne, Gertrude Street that sells a range of hand crafted items from Mexico. I received four ceramic skulls with colourful and decorative designs that have been painted onto the front and the back; I soon realised that the hand crafted skulls could be used as a necklace. There are two small holes on the left and the right hand side of the skull that would allow you to create a bracelet or a necklace, I must admit the thought is rather exciting as the skulls are rather vibrant and colourful, they would compliment all my grey and black t-shirts that are hanging in my wardrobe. At the moment, I have placed the ceramic skulls on top of the television cabinet, I must admit all the different patterns and designs compliments the furniture within the lounge room, in fact the colours are so bright I just can’t seem to take my eyes off them! 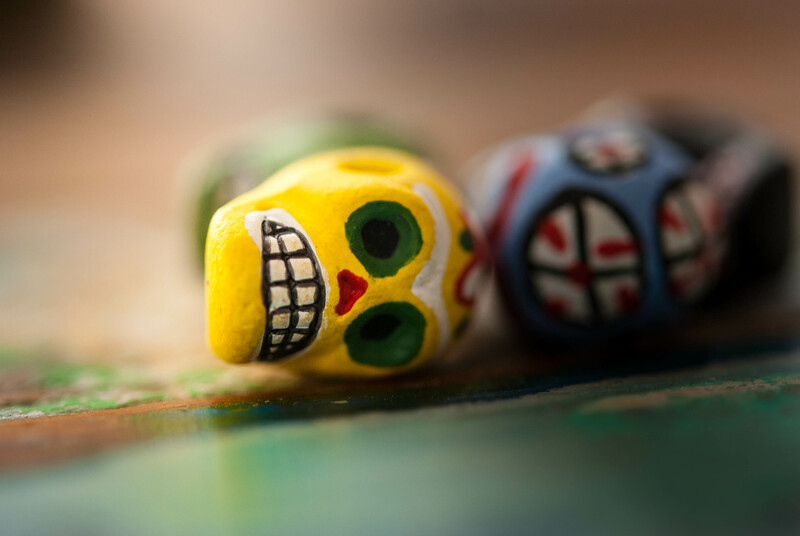 The ceramic skulls are very small, they’re minuscule to be precise, although it is the actual size that provides these hand crafted skulls with some interesting characteristics. I have to hold the skull with my fingers in order to closely examine the various patterns and designs, when I am holding the ceramic skulls, I always find something different, something I haven’t noticed before. The base of the ceramic skull features quite a high level of detail for something so small; I also noticed that the hand crafted skulls also feature lively and animated expressions, all four of them seem to be grimacing or smirking. So I’m not exactly sure who has designed these ceramic skulls, although I do know that the skulls were purchased from Amor Y Locura, a local boutique store that sells a range of Day of the Dead merchandise. The skulls are associated with the Mexican Day of the Dead Celebration, a celebratory event that reunites the living with the deceased. 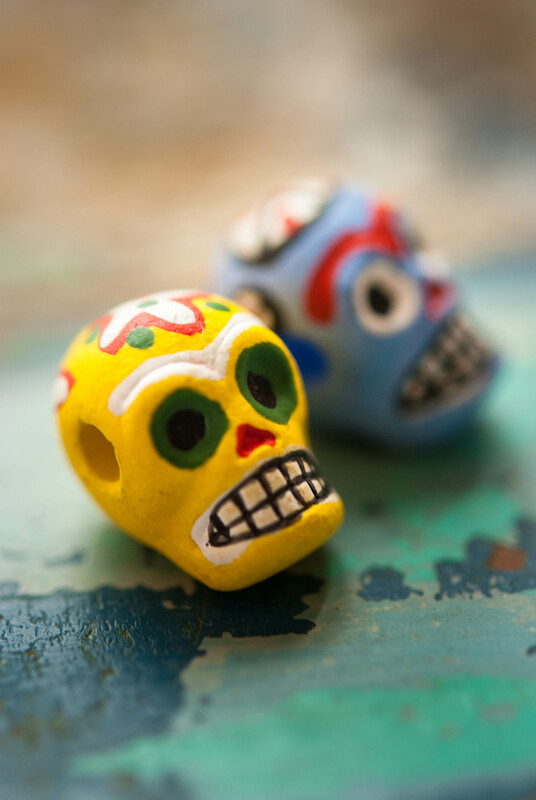 The hand crafted skulls are often used for parades, markets, altars and other activities that symbolise Mexico’s cultural and spiritual connection with the deceased, as referenced by Regina. M. Marchi. A couple of weeks ago, I decided to browse through a magazine known as “Latin Flavours”, the publication features various articles and reviews in relation to authentic latin cuisine as well as small local businesses around the city of Melbourne. At the very front of the magazine, I discovered Amor Y Locura (Love & Madness) that is currently owned by Mandy Patron who is inspired by traditional and contemporary Mexican art. Patron ensures all artists receive a profit for their delicate hand crafted items that are imported from Mexico to Melbourne, Australia. What I truly love about this store is the fact that nothing stays the same, every time I walk into Amor Y Locura, I always find a new selection of wooden, ceramic and papier-mache skulls. The store does sell a range of unique hand crafted products that you wouldn’t be able to find anywhere else within the city. Another thing I find particularly fascinating is the name of the business, Love & Madness reflects Patron’s own fascination with Mexico’s cultural and spiritual heritage. Latin Flavours features a monthly magazine that is often found within restaurants, cafes and boutique stores around Melbourne, if you ever find yourself wondering around the city, I would suggest taking a copy to read, the magazine often features some very interesting articles and recipes. Don’t forget to visit Amor Y Locura the next time you are in Gertrude Street, they have a wide selection of Mexican hand crafted antiques! Please click on the link below for further information. Regina.M. Marchi, The Day of the Dead in the USA: The Migration and Transformation of a Cultural Phenomenan. New Jersey: Rutgers University Press, 2009. 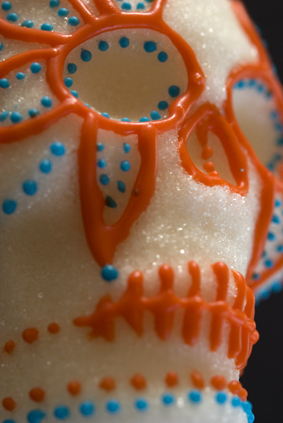 In my previous post, I discussed the blue and orange sugar skull that I produced a couple of weeks ago. Lucky for me, the icing sugar was completely smooth and I was able to create an interesting design without the mixture running all over the place. I photographed the skull against a wooded table; the composition did produce some interesting textures, although I have decided to use a back drop for my next round of photographs. The black backdrop definitely contrasts with the colourful patterns and designs. I was so focused, I had actually taken 174 photographs in total; I suppose it’s better to take lots of photographs in case there are some that are too over exposed or under exposed. 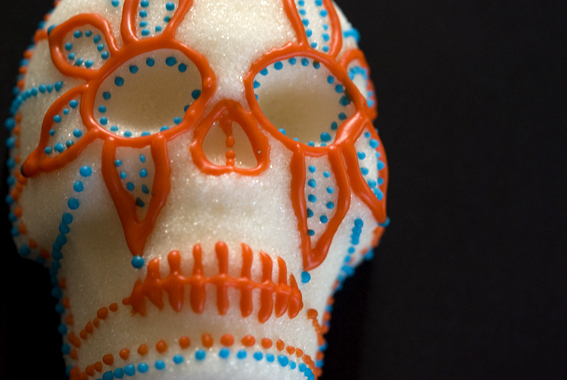 I do prefer the black backdrop; the background does work well with the colours I have used for the sugar skulls. Enjoy! 18/12/12 – Day of the Dead Store on Gertrude Street offer Amazing Stock ready for Christmas! The other day, my supervisor from uni had shown me these small ceramic skulls that she had purchased from the Day of the Dead Store in Melbourne. I just could not help myself, I quickly ran into the store and bought three ceramic skulls for myself; two in black and white and one in colour. The skulls do appear to be hand crafted and the beads have proven to be very popular; I have seen many visitors within the store purchasing these small ceramic skulls. There were only a few left in stock as soon as I arrived to Amor Y Locura on Gertrude Street; an amazing Mexican store that sells a range of Mexican cookbooks, art books papier mache Skulls, hand crafted skeletons and jewellery. It’s very hard to walk into the store without buying anything, I must admit. At first I was going to buy one skull and I walked out of the store with three, If you can leave the store without buying anything, you much have a lot of will power! Amor Y Locura do rotate their stock on a regular basis, so it is worth checking out the store for new stock. Now that I have the beads, I can now make a necklace, I just have to find a local jewellery store where I can purchase some thread. So before I parted from my beloved sugar skull, I decided to take several photographs with the sunlight glaring through the window.I have already taken photographs of the skull at night time and I thought I would quick take a few extra photographs in the morning just before I caught the train up to Melbourne. The light wasn’t as bright as I was expecting but I did manage to take some good quality photographs. Skull Bow and Bandanna from Gasoline Queen, Richmond. 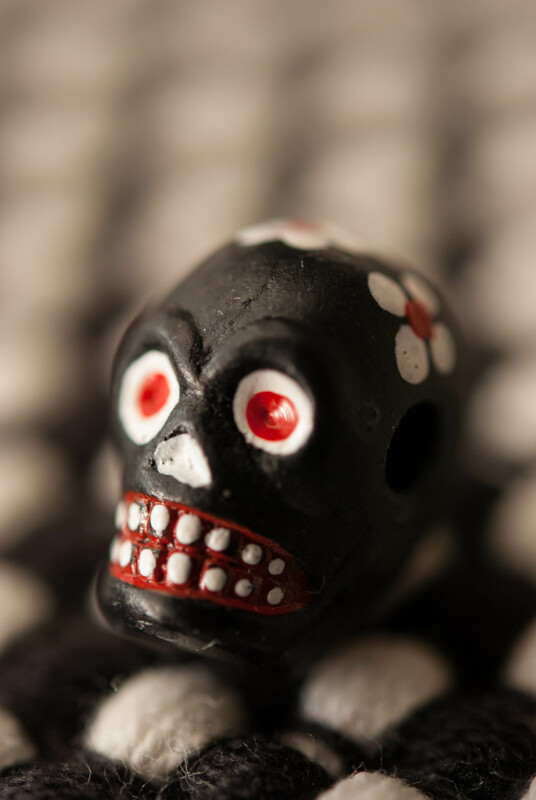 6/12/12 – Day of the Dead and Skull Merchandise at Local retail store, Gasoline Queen. During my visit to Richmond, I had discovered a retail store on Bridge Street known as Gasoline Queen. As soon as I noticed the skulls within the colorful and artistic window display, I could not help myself, I just had to walk inside. The products on display were different from any other store I have ever seen; there were Day of the Dead skulls, hawaiian dresses and punk / rock outfits. As soon as I recognised the skull bandanna and the skull hair piece, I immediately walked up to the counter to buy these lovely products within the store, honestly one can never have too many skulls! The hair piece is a bow that you can clip into your hair; what I do love about this item is the skull on the very front; it kind of reminds me of Day of the Dead mixed with kitsch. I just had to buy this bow as I have never seen these products sold anywhere else around Melbourne. What really excites me about the bandanna is the fact that i have been looking for one for months and all of I sudden I found one when I wasn’t expecting, I was kind of surprised actually. So if you are looking for some original skull merchandise make sure to take a trip down to Richmond so you can see all the amazing products for sale; it’s challenging to walk out without buying anything. This store is great for skull merchandise as well as t-shirts, dresses, skirts, high heel shoes and other fashion accessories. I also had a conservation with the lady in the store who was very enthusiastic about the Day of the Dead and tattoo art; with all the t-shirt designs and products available at the moment, I would say that tatoo art is becoming a very popular trend especially in contemporary fashion, art and design. For more information please click on the link below to visit Gasoline Queen’s Facebook Page. I would defiantly recommend visiting this store if you are interesting in purchasing some Day of the Dead or skull related products! A couple of weeks ago, a friend of mine had forwarded some images of Krisztianna’s amazing wall sculptures via Facebook. 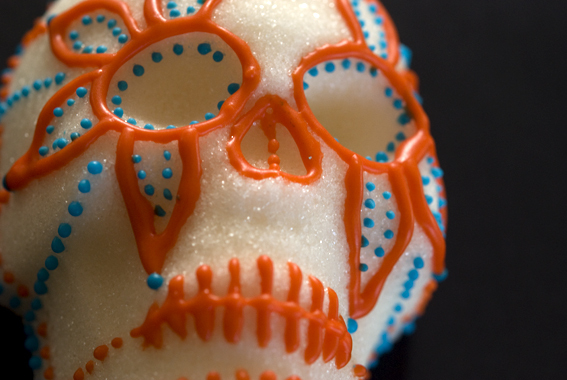 Krisztianna is an artist who has designed a series of sculptures that do appear similar to the Mexican Sugar Skulls. There is limited information in regards to the artist’s work, although the creations / designs that are currently displayed on Krisztianna’s website do contain similarities to the Mexican Day of the Dead Celebration. According to the artist’s own website, there are at least four sculptures within the collection that represent the four different seasons of the year. This is quite an interesting concept and each sculpture does feature a different design; the level of detail is incredible and the bold colours are definitely eye catching. The reference to the skull face painting and the floral headdress may reflect Mexico’s cultural heritage with the dead; I remember attending a sugar skull workshop a few weeks ago and the young lady had said that flowers, especially marigolds are a significant part of Mexico’s Day of the Dead. What I do find really interesting is the way the sculptures / installations have been displayed, the remind me of those deer plaques that are usually mounted to the wall. Krisztianna’s work applies the Mexican Day of the Dead with some creative and innovative concepts; the overall installation / display is aesthetically pleasing and the decorative illustrations do provide a high level of inspiration!